A compact tourist guide for Barcelona that covers all the needed information and advises about the best restaurants, attractions, hotels and the shopping spots. What are the ingredients of life? A fistful of history, a little art, some music, dazzling seas, partly happiness, partly blues, enough of sun to warm up, and joy. Spain's most attractive city Barcelona has everything that life offers to us. Without hesitation, it is also one of the most favorable cities in the world that makes you feel alive. Barcelona is the epitome of life. Welcome to the city of passion, alias Barcelona! The people of Barcelona are calm. They do not seem to struggle much with life. Seizing the life is meant for them. They are experts on making the most of the life. Relaxing and joy always comes first for them like all the other people of Spain. Barcelona’s mild weather makes also the people’s hearts mild. Everyone is helpful, happy and smiling in this fabulous city. Having a coast on Mediterranean, Barcelona is a typical Mediterranean city. Finding fresh vegetables and fruit is easy at any time. People prefer sitting at open-air cafés and sunbathing by the seaside. What is more, they are passionate for dancing and music. The dance of passion, Flamenco is something you can encounter in the streets, not necessarily in clubs. The last but of course not the least, FC Barcelona is another passion of the locals. Having a coast on Mediterranean Sea, Barcelona is situated on the southwestern part of Spain bounded by Serra de Collserola. It is on the southeast of Madrid. One of the symbols not only of Barcelona but also of Spain, La Sagrada Familia, though unfinished for nearly 130 years, visited by 2.8 million tourists a year. Built by Gaudi, La Sagrada Familia should definitely be at top of your “must see” list. Get to know the great artists and discover their houses and the museums. 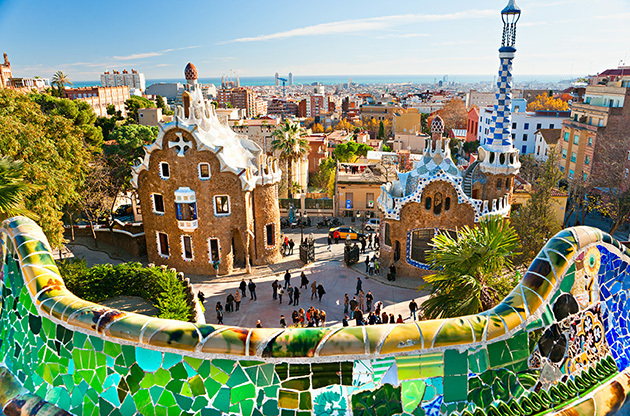 La Casa di Gaudi in Park Güell, Picasso Museum and Dali Museum await you to charm. Stretching for 1.2 kilometers long from Placa de Catalunya to Port Vell is one of the reason why this city is that charming. Offering so much to see, La Rambla is the most stunning street in Barcelona. No matter you are a football fan or not, do not miss the chance to visit the home of the legend, FC Barcelona. Being the largest stadium in Europe with over 96000 seats, Camp Nou is one of the most important tourist attraction. Located by the sea, Maremagnum consists of many bars, restaurants and fashion stores. Remember that August is the month of discounts in the city and Maremagnum is open even in Sundays. Boqueria is a public market offering a great diversity of goods from vegetables to delicatessen. Nightlife in Barcelona is different from Madrid or the any other city. You can start the night at 02:00 and dance and drink till the morning. What is more, if you go to a bar or a club before midnight, they may offer you drinks at reduced price. If you get really tired at the lectures during the day, we think it is time to chill out. Located near the sea, Opium is the best nightclub in the city. Dressing up is a must. Standing at the end of the Barcelonata shore, Shoko is another great club in Barcelona. Serving as a restaurant both at noon times and evenings, Shoko turns into an awesome club at nights. Barcelona is a perfect city offering you diverse tastes of Spain. At lunch or dinner, whenever you find the time make sure you try tapas, paella, seafood or sangria in unforgettable restaurants. Serves the best seafood in the city located in Calle Escudellers. Stop by for the best Sangria in town. For the ones who want to taste the best tapas in the city or maybe the best of Spain. Ranking the first on The Guardian’s “10 Best Tapas Bar in Barcelona” Quimet I Quimet deserves its reputation. When you have the chance, stay a few days longer and join one of the sailing trips to surround yourself with the charming hues of the Mediterranean blue in Spain. Discover the passion of the world-renowned dance of Spain, Flamenco. It is the best chance to understand the Spanish people's commitment to life. Being the first class tourist destination in the world, Barcelona can be considered the ideal city for international meetings. Having some of the largest venues and hotels in Europe, Spain's apple of eye Barcelona deserves being the ideal meeting point. Its dynamic spirit, favorable climate, both historical and modern background encourage the visitors and provides the perfect environment for international large scale events like symposiums, fairs, exhibitions, tradeshows and congresses. Pickpocketing is a problem in Barcelona so try to guard yourself especially in crowded streets like La Rambla. Try not the pay attention the shuffle scammers since the spectators can be involved in the show they can pickpocket you while you are amazed by the show. Do not fall for the sellers of bouncing cartoon characters. These products just won’t work at home since they are hooked up with an invisible wire.